"One of the best things about college is the informality, with everybody at the same level." Two “brilliant” Derby College diploma courses are propelling student George Endsor towards a career in woodland management. Nineteen-year-old George says the friendly and professional teaching style of the lecturers at Broomfield Hall is helping him to achieve his dreams. 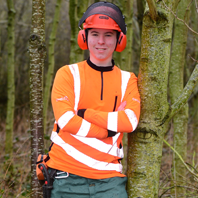 The Derby teenager, who has Asperger Syndrome, is already self-employed, working with a tree surgeon and also in woodland management. He said he felt lucky to be on the path to not just a career but to a lifestyle as well. George is currently working towards his Level 3 Extended Diploma in Agriculture, which he will complete this summer. Those studies follow on from his Level 3 Extended Diploma in Countryside Management, which he passed with a distinction. After his GCSEs he took a “split-second” decision to apply, because he had in the back of his mind an enjoyable open day organised by his school at Broomfield Hall. George said his two diploma courses go hand-in-hand with his woodland management work. The knowledge and skills he gained at college had played a major part in him getting a “foot in the door”. Registered as self-employed, George handles his own books and works for two days a week, with three days at college. He said that in the future he may increase his qualifications with an apprenticeship in arboriculture, or go on to take Countryside Management at University. In addition to studying and his jobs, George is in the Royal Air Force Air Cadets, where he has risen to become the Cadet Warrant Officer – the highest ranking cadet – in the 126 City of Derby Squadron ATC. Find out about studying Agriculture at Derby College.